When you have a big family, the key to having a clean house is organization. 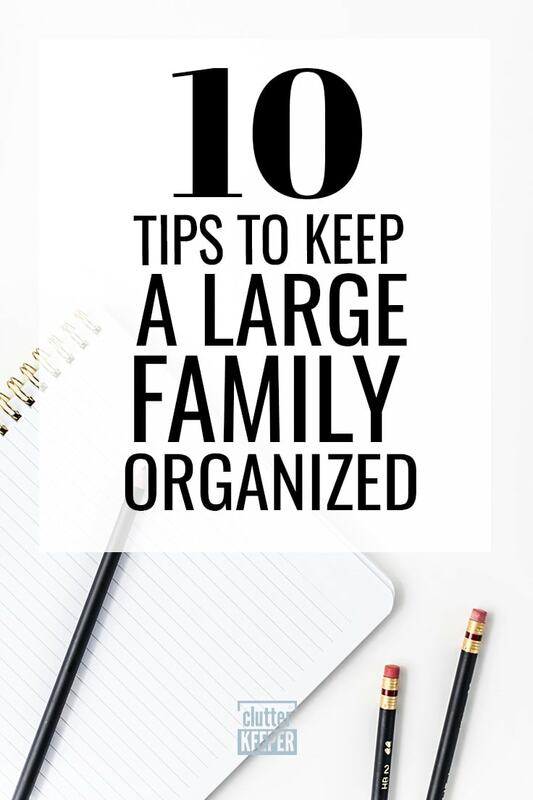 Learn how to get started with these 10 ways to keep a large family organized. We know that having a large family can be tough. Not just trying to corral that many kids, but trying to keep the house intact too. Luckily, the key to a clean and orderly house is organization, and it couldn’t be easier to learn how to get started. Here are 10 practical large family tips that will keep everyone and everything organized. Disclosure: If you make a purchase through links in this post, we may receive a commission. Keeping your family and home organized will be simple with these 10 practical tips. Don’t forget to pin this post so you can reference it later. Having a large family can make it harder to keep up with everyone’s messes. Teaching children to pick up after themselves and keep their belongings neat goes a long way in keeping a large family organized. Having each family member be responsible for their own messes and belongings means nobody has to clean up after anyone else! Of course, there will be exceptions and family members will need help now and again, but this prevents things from piling up and becoming unbearable. Have a bin for each family member, parents included, where they can store items they need frequently, and where things can be placed for them. These bins can serve as a one-stop shop for everything they need to see, from mail to toys they left out, to chore assignments! If you’d rather use them for general storage, bins are easy to label, stack neatly, and can be easily organized in any way you can think of. Bins are a great organization tool, no matter how big your family gets. Have a central place for the family to leave notes, get supplies, check the calendar, or anything else they all need access to. By having these things all in one place, you’ll stop each family member from having to create their own area and can keep everything organized in one place. Command centers are a surefire way to keep everything your family needs day to day in one easy to use area, making organization a breeze. If you’re ready to get started, these 13 family command center ideas will inspire you. Assign each member of your family a color, and use it to help them stay organized. By color coding, you’ll make it easy for children and adults alike to organize at a glance, and make sure everyone gets what’s theirs at the end of the day. Color coding is a mainstay of organization practices, and for good reason! Each night before bed, go around to each room with your family and clean up anything that got left out or disorganized during the day. 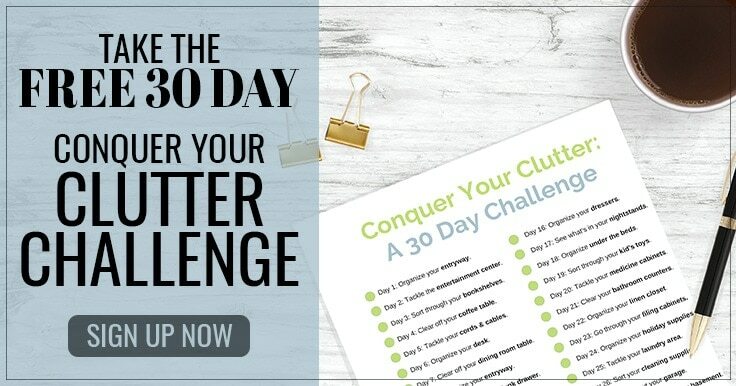 By letting everyone go around and collect their items and clean their messes, everyone gets to start the next day with a fresh start, and your house will stay organized long term. Keep in mind, these nightly cleanups mean actually putting things where they go, not just hiding the mess or tidying up but actual organizing. With a large family, that means more birthdays, more holiday gifts, and more chances for items to come into the house. While getting new things isn’t a problem by itself, it typically leads to more and more stuff being accumulated, leading to clutter. Instead of accumulating more and more stuff, start a “One In, One Out” policy. Any time someone brings a new toy, gadget, or anything else into the house, they need to also get rid of one thing. This could be as simple as buying a new pair of shoes and getting rid of the old pair. A lot of the clutter we end up with around the house that isn’t just trash is items that don’t get used often, if ever. Go through the house and take a good look at what really gets used, and what might not need to be out all the time. Once you realize how much isn’t used, start a long-term storage area in your attic or basement. This area will hold items that you need or want to keep, but don’t need to be out or easily accessible. A lot of the visual mess when you first step into your home with a large family is going to be a pile of shoes inside the door, and jackets that didn’t quite make it to the closet. Clean up that messy area with shoe racks and coat hooks! These will not only help your home feel less chaotic but will also keep clothes off the floor and give shoes room to breathe. Paper clutter is a huge factor for many families, and even more so with large families. Report cards, tests, art projects, notes, homework, the list goes on! With all this paper things tend to just get left on the table or strewn about your children’s rooms. Solve this problem with filing cabinets. You could have a separate one for each child or split it up by drawers. Use them to keep these papers sorted and out of sight! 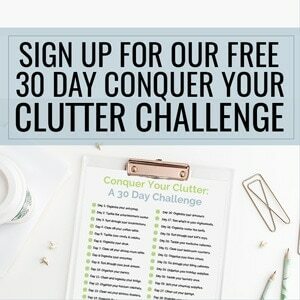 For more ideas, read these 10 simple ways to reduce paper clutter. Most families have a few trash cans, one in the kitchen and maybe one in each bathroom. That’s good, but the number one reason trash doesn’t get thrown away is that it was “too far” to walk. Save yourself the excuses and the mess by putting a small trash can in each room, ensuring no matter what it is, it can be disposed of easily. Having a large family shouldn’t mean having to give up on a clean home! With these tips, they’ll be clutter conquering machines and you’ll have the organized home you’ve always dreamed of. No matter what methods you choose, organization will be harder the more people there are. The good news is if you follow these tips and keep up with your routines, you’ll have an organized home no matter how many people are in it. Now that you are armed with some large family tips, here are more ideas that will help you keep your family organized. How to Get Kids to Do Their Chores – This post includes a list of chores toddlers can do too. 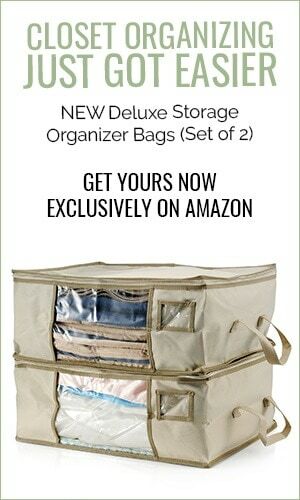 Don't miss the latest organizing tips!